• Capacity for 8 height-adjustable trays with up to 7 channels each. • Correct sale detection with photocells. • LED lighting with on/off programming. • 1462 x 473.5 mm glass front door. expiration date by selection number or channel. at any time without using tools. • Adjustable motor torque for each selection. • Power mains: 230 V, 50 Hz. • Estimated energy consumption: 650 watts. • Modular cabinet structure treated against rust and corrosion. • Vandal-proof security lock with three anchor points. • High-capacity cash box with lock and optional autolocking during extraction. efficient cooling and lower energy consumption. • MDB or Executive protocol. • Card and banknote readers can be fitted. • Compatible with the Jofemar EasyFlash handheld terminal for stock control and accounting. • Compatible with the latest telemetry systems for the end-to-end remote machine management. • RS232 port with accounting data output. • Jofemar J130 card/key reader or any card reader that uses the MDB protocol. • Pop-up billboard advertisement on the elevator. • Modem installation and Vending Track communication interface. • Online operation with real-time control of users and sales. 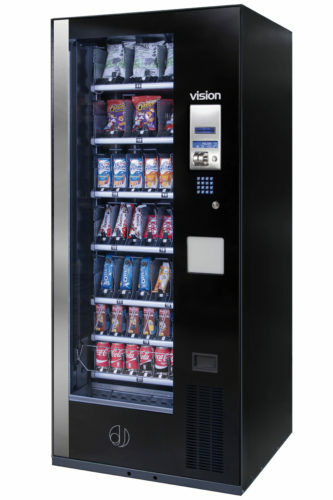 • Management of up to two slave vending machine for higher capacity and number of selections. • External microwave ovens detached column controlled by the master machine. Self-activated when a product has been dispensed from the master machine. Individually heating time programmed per selection. cartons, chocolate, healthy food items and similar products.